As a feature, it has to be said that Laurel and Hardy's Way Out West has a pretty thin plot. The boys are on the road again and heading for the town of Brushwood Gulch where they have been instructed to deliver the deed to a gold mine bequested by a dead prospector to his impoverished daughter, Mary Roberts (Rosina Lawrence). Duped instead into handing it over to a crooked saloon owner and his showgirl wife (the reliably wild-eyed and irate James Finlayson and Sharon Lynne), Stan and Ollie connive to get it back, knocking each other over and getting tickled a good deal in the process. Er, that's it. The only clues we have that this is even the Old West - before the boys are eventually overtaken by a stagecoach - are that their coats are slightly longer than usual and their familiar clanking jalopy has been replaced by a pack mule named Dinah. What follows would just be business as usual but for a handful of musical interludes that elevate the piece to immortality and are surely among some of the most inspired moments ever committed to film, all the funnier for coming from such an unlikely source. Elegantly choreographed dancing and sweet syncopation are the last things you'd expect to see from these two self-proclaimed saps. First up is their irresistible impluse to bust a move to Marvin Hatley's song 'At The Ball, That's All', being performed on the tavern steps by period vocal group The Avalon Boys (who also appeared briefly in Pardon Us, 1931, and the W.C. Fields comedy It's A Gift, 1934), which is simply one of life's great joys and the mother of all funny dance scenes. I've posted the original below rather than one of the myriad anachronistic remixes uploaded to YouTube by various wags, although this Soulja Boy mash-up is admittedly oddly pleasing. 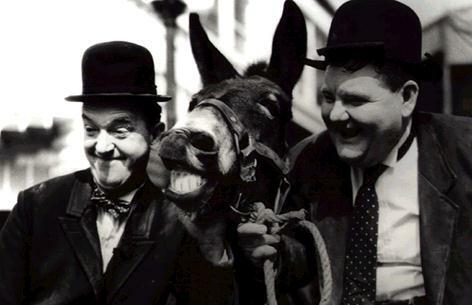 The second such gem is, of course, 'The Trail Of The Lonesome Pine', a lovely little ditty in its own right written by Ballard MacDonald and Harry Carroll in 1913 that was released as a single in the UK in 1975, long after Stan and Ollie had passed on, reaching a respectable number two in the charts. The b-side was 'Honolulu Baby' from Sons Of The Desert (1933), incidentally. The film's closing number, 'We're Going To See My Sweet Home In Dixie', is also a peach and brought on by Ollie and the heroine getting nostalgic for the Old South and the promise of home-cooked "possum and yam". Yuck.